The first time I had grilled fish this way, was during Kem Bina Insan Guru, of which every trainee teacher has to attend, it's supposed to build 'soul' (character, hahaha). Each team had to cook their own meals daily. The menu is fixed and ingredients given fresh everyday. 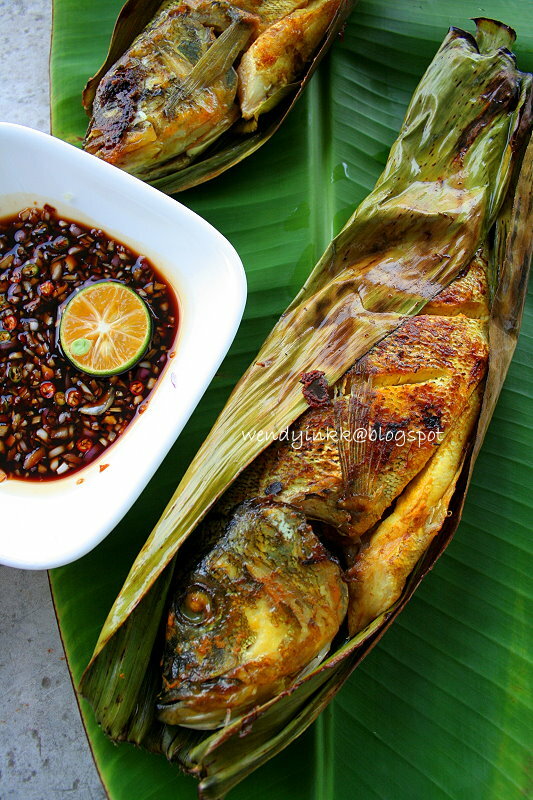 One day, we were given some small fishes and the menu for that meal is Ikan bakar (grilled fish) and from there, I witnessed how my team mates went around plucking banana leaves, smothering the fish with salt and turmeric and then.. grilled them in the wok! Malay home style grilled fish. It was delish! I had been wanting to replicate this for quite a long time and on one lucky evening at the night market, I happened to purchase some big and cheap calamansi and a few weird looking fishes, and at the same time was given some banana leaves by a relative. It was that spur of the moment that eh, I seem to have everything on hand! Perfecto! Cut some slits on the fish's body. Rub some salt and turmeric powder onto fish, into the tummy cavity, into the slit and everywhere. Wrap with banana leaf. Put some oil into wok, use high heat to heat up and put in the wrapped fishes. Put the lid on and let it cook on med heat. After 2 minutes, remove lid and flip the fishes. Cook until you can see the fishes have turned slightly golden and the leaves are brown, almost charred. 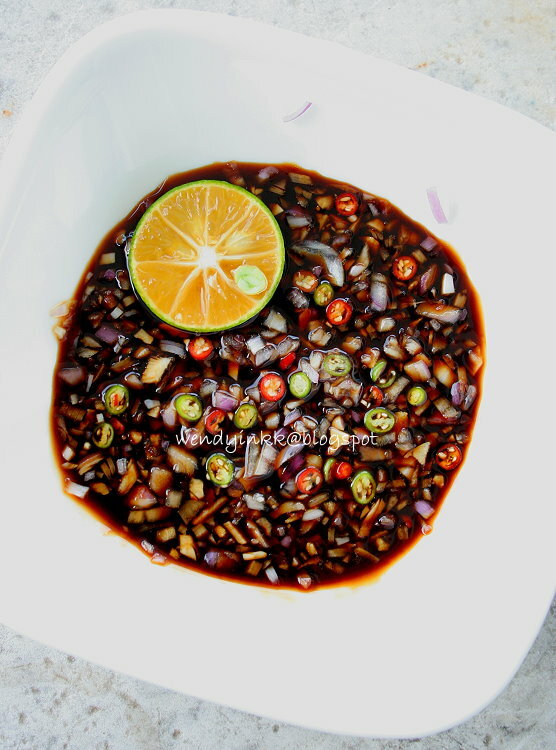 To make sambal kicap, chop some shallots and bird's eye chilli. Mix with kicap manis (I used ABC brand) and then squeeze some calamansi juice over. There's no exact recipe, it's up to your preference. The fish tasted like fish, haha. I could taste the fish you see, not that it tasted like chicken. 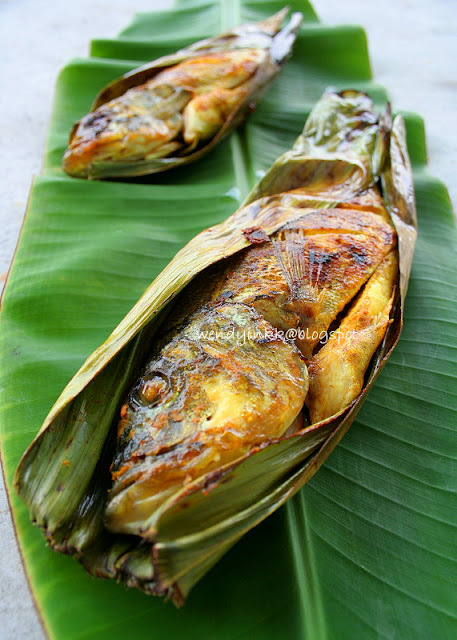 The common local hawker style grilled fish is spicy and flooded with gravy. I taste the chilli more than the fish at times. But no, not this simple method. 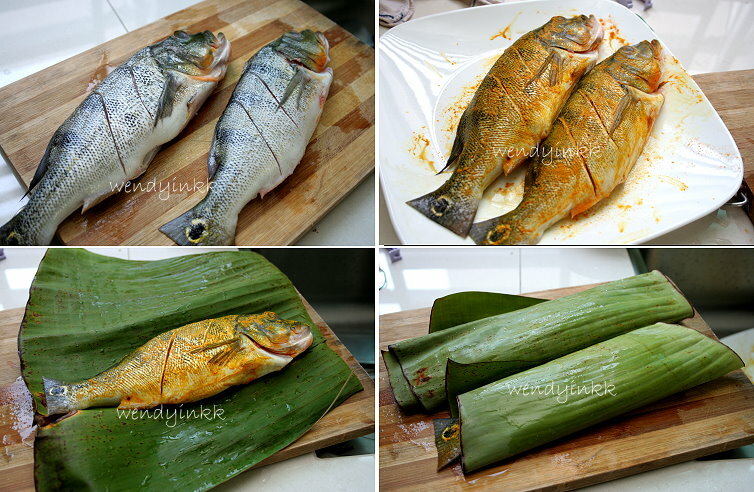 The banana leaf wrapping give the fish a smoky flavour, and the turmeric helps reduce the fishiness. Turmeric is good for you, so slather them on! This is such a good idea. I learn something new today-grilling in the wok! 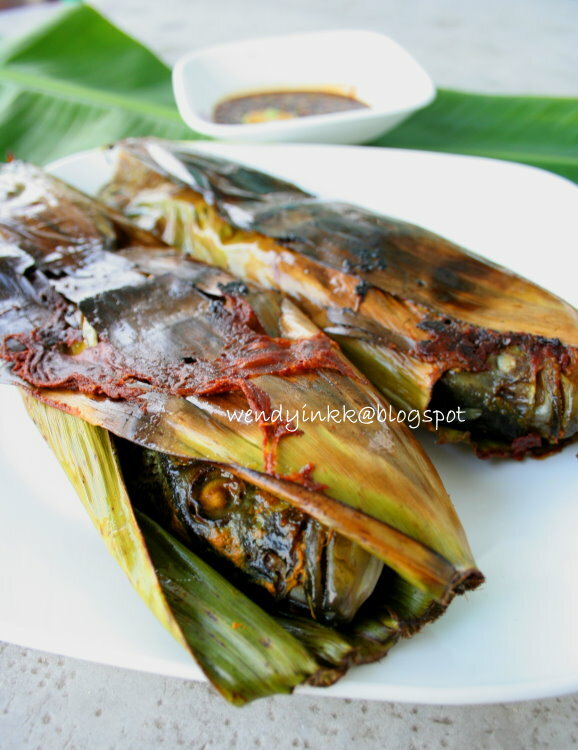 Yah, next time if I can get banana leaves, will sure try this. Wendy, this dish sound and looks delicious, and seem easy to prepare too, may be I should give it a try. Those hawkers do wrap with banana leaves too right? Here they do. frankly, I had no idea what those fishes are, that's why I said they looked weird, I have never seen these around. LOL. Easy to cook lor, sekejap sahaja! I am really envy with that fresh banana leaves!!! Brilliant idea to grill this in the wo ! Simple and easy recipe ! Thanks a million .. Interesting method by grilling in wok!! I always like simple to do recipe. Got to go to get some fish. Never knew about using the wok to grill fish, this is grewt. Must try one day. Sounds like no oil splatter then? Love the kicap calamansi sauce! 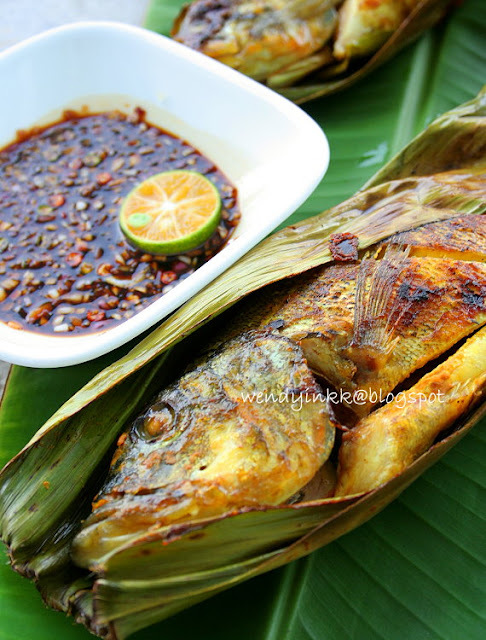 jungle style grilled fish..good idea and less oil! Wow! That looks divine!! You got wonderful posts here! Loved your style of cooking and writing.. Glad to follow you. Do visit my blog in your spare time..
Love this!!! From the fish to the coconut leaves to the dipping sauce to the lime!!! !